Making a ceiling repair claim? Need a professional quote for your insurer? 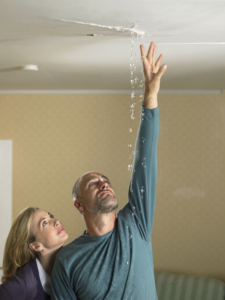 If water is dripping from your ceiling and you’re making a claim for a ceiling repair, just give IC Assist a call. As insurance specialists, we deal with this type of damage all the time and are here to help. Most home owners just don’t know what to do when they’ve got water leaking through their ceiling. They often have lots of questions they need help with. The first and most important one being – is the water damage covered by my home insurance? So they call their insurance company to find out and they just say “get a couple of quotes for the repair”. This often creates more confusion as they then don’t know who to call to deal with it. Should they call a plasterer, decorator or builder? Then the next problem is – what do they ask the contractors to quote for? Home owners are not property repair experts. They don’t know exactly what work is necessary to fix it. So they rely on the contractor to have the knowledge to assess their property. A plasterer or decorator won’t look for potential damage hidden underneath. This means they can overlook water damaged joists, floorboards and insulation. Also, just because your insurer has told you to get some quotes, does not necessarily mean that they have approved your claim. So how do you know if your insurer will actually cover the cost to repair your ceiling and any other resulting damage? Don’t worry, we’ll advise you if we think you have a valid claim. We will look at the cause of damage and your policy wording to determine this. A professional and stress free solution to your ceiling repair claim. Don’t let your claim stress you out. With our years of experience in the insurance industry, we will advise if your insurer should cover the damage. Also, we provide a complete property restoration and drying service. Therefore, you don’t need to contact multiple companies as we can do it all! But the best bit is, we will manage all aspects of your claim on your behalf at no cost. This means we take care of everything, which saves you the time and stress of dealing with your insurer, their Loss Adjuster and multiple contractors. Getting estimates for the repairs to your ceiling. It’s likely that your insurance company has asked you to get a couple of estimates for your ceiling repair. However, if you appoint IC Assist to manage your claim, multiple quotes are not usually necessary. This is because we are professionals in the insurance restoration industry. Therefore, most insurance companies and Loss Adjusters are happy to work with our comprehensive quote. Once your insurance company has validated your claim and agreed the reinstatement works, they will simply compare our estimate with their own set rates. If there is a variance, we will negotiate with your insurer to agree a reasonable price. If however, they insist on another quote, don’t worry we can arrange this for you. As you have a duty to act quickly and prevent unnecessary damage, time is of the essence when you’ve got water in your ceiling. So please don’t waste time ringing around trying to get multiple quotes, just give IC Assist a call. As in the time it takes you to get several contractors out to look at the damage and then wait for them to give you a price to do the work, the damage can get a lot worse. However, after just one call to IC Assist, we will book an appointment to assess the damage and send a quote to your insurer in half the time! We will professionally assess the damage. If you don’t know how to fix a water damaged ceiling, just relax and leave everything to us. We have knowledge, experience and skills to assess any type of damage. As part of our FREE service, our Claims Manager will document the affected areas by taking pictures, measurements and moisture readings. He will then use this information to determine the most effective restoration method. Checking the moisture levels in the affected areas helps identify what materials our contractors will strip out and whether drying equipment is necessary. We will then produce a detailed schedule of works and send it straight to your insurer for their approval. As soon as they agree the costs, we will then instruct our contractors and manage all repairs through to completion. We can help any type of ceiling repair. IC Assist can offer assistance with all types of ceiling repairs, including any other restoration necessary. The most common claims we manage are normally due to a water leak in the ceiling below the bathroom. However, we also get called in to help with collapsed ceilings as a result of a pipe bursting, or tank overflowing. In these circumstances, water can track to multiple rooms and re-decoration may be necessary to; the bathroom, kitchen, bedroom, lounge, or hallway. If this has happened to you – don’t worry! Our professional contractors will restore all rooms with minimum disruption. ✓ Plasterboard repairs – if you have mold from a water leak in your ceiling, we will cut out the affected area and renew it. ✓ Re-plastering – where ceilings have collapsed or a section has been cut out, our plasterer will re-board and skim it. ✓ Water stain removal – if the plasterboard is intact and there is no mold growth, our decorators will treat and paint it. ✓ Lath and plaster replacement – removing the laths and mortar from this type of ceiling can be a very dusty and messy job. But don’t worry, our contractors will protect your home and belongings during the removal and will clean up too! ✓ Cracked or broken Artex coatings – care should be taken with Artex repairs as Asbestos was used in these products until 1999. So if your property was built during that period, we will take a sample of the Artex and test it before disturbing it. Stained ceilings often require more than just stain blocking and painting. Even if you were lucky enough to notice a leak and fix it promptly, it can still create a water spot or stain on the ceiling which look rusty or brown in colour. 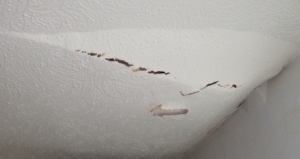 Spots, patches or cracks are typical signs of water damage on ceilings. They are often as a result of a bath or shower waste trap failing. Although it may appear minor, it’s important that you get a professional assessment. As in our experience, stain blocking and painting a water stain isn’t always sufficient. As pipe work can be unsightly, most people tend to cover them up. Therefore, most customers only notice plumbing issues once it’s too late and marks show through. By this time, the underside of the plasterboard and insulation may be soggy. We will take moisture readings in all wet areas, as this is only way to determine whether to dry and stain block or replace it. The picture shows a job we were managing where a dripping toilet caused a stain on the ceiling below. We check moisture levels on stained surfaces, as mold could be growing on the underside of the plasterboard. In order to choose the best restoration method, we always take moisture readings. As in our experience, most of the plasterboard we test, is usually saturated and requires replacement. Mold growth is very common with water damage in ceilings. 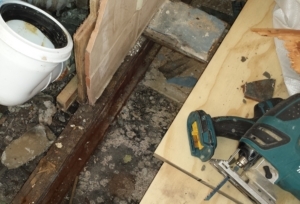 We often uncover mouldy plasterboard during the removal of bathroom floors (as shown in picture). It is really important that we identify and deal with it quickly to prevent it spreading, This will avoid major problems developing in future (which your insurance company will not cover!). There are a number of ways to see just how sodden and weak the board is and if mold is present. The simplest way is to remove the defective section. This allows you to easily see what condition it is in. If however, your bathroom floor is also damaged, we can inspect the underside of the board during the renewal of the bathroom floor above. This is the preferred method as you can check the condition of all boards in the vicinity of the leak. Alternatively, we can arrange a Borescope inspection, which your insurer should pay for if there is no other way to inspect the full extent of the damage. Please be aware that most general contractors try to fix water stains by covering it with stain block and paint. Although this can hide the marks, it won’t actually remove the water stains from the ceiling and it doesn’t deal with any issues hiding beneath. Therefore, this type of ceiling repair isn’t always the best solution. 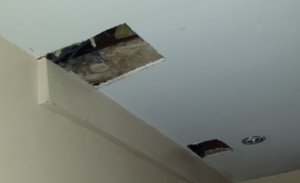 Bulging ceilings can be dangerous – they must be drained & supported to stop them falling down. If you don’t spot and fix a leak promptly, small cracks can quickly become a much bigger problem. If the water cannot escape, it can accumulate and pool. This is what causes the sagging and bulging. Sometimes customers don’t realise there is a problem until water starts dripping through the ceiling, after taking a shower or bath. If you have a bubble in your ceiling from a water leak, please give us a call as soon as possible. If water continues to collect, it can be dangerous as the plasterboard can collapse. To prevent it caving under the pressure, we will support the bulge and release the build up of water, by piercing a hole in the bulge. Collapsed ceilings can be messy – let us deal with the aftermath! When a pipe bursts or a bath/tank overflows, plasterboard can easily break under the pressure causing it to collapse. In most cases, it just gives way when you least expect it. Recently, this happened to one of our customers (see picture). Her water tank was leaking through her bedroom ceiling and it came crashing down while she was sleeping! Unfortunately, the water didn’t just damage her bedroom. It also tracked to her hallway and living room. So we brought our team in to re-decorate all 3 areas. If you’re looking for assistance with a ceiling collapse caused by water pouring through, just give us a call. We know how messy and unsightly these types of claims are and will work hard to get your home back to normal quickly. It’s important to choose a specialist to avoid problems occurring in future. A very distressed lady sought our advice when her ceiling fell down. 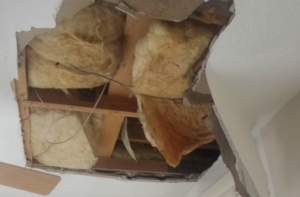 Her insurance company were refusing to cover her ceiling repair costs. They claimed it was as a result of the plaster failing. In actual fact, several years ago a pipe burst in the flat above and the contractors didn’t assess it properly. They thought that just painting it was sufficient. This is a perfect example of why choosing a company with the right knowledge and experience is so important. Most contractors don’t have the equipment or knowledge to restore water damage. 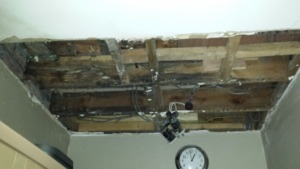 Ceiling repair claims in flats and apartments. 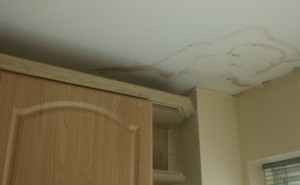 Escape of water claims in flats can cost insurance companies tens of thousands of pounds to restore. This is because water can track down from one flat to the next, damaging several properties in the block! We find that the most common cause is plastic pipe fittings failing. Over the past few years, the use of plastic push fit plumbing in apartments is rapidly increasing. This is because it is quicker, easier and cheaper to install. As a result, our office receives a lot of calls for help when a push fit pops off or fails. Other problems flat owners require assistance with are; pipes bursting, leaking washing machines and boilers bursting or exploding. So, if water is tracking down from the apartment above and you need help with your ceiling repair, just give us a call. We can not only help with any other damage to you property, but we can also manage your neighbour’s claim too! Trying to get hold of your neighbour to progress your claim can be a difficult task. So why not let us deal with that for you. This not only removes all the hassle from you, but also allows the repairs to start sooner. 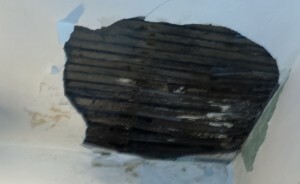 Other types of damage caused when tracing and fixing a leak. Patch repairs are usually necessary in two instances. Either when a hole is cut to release pressure and prevent the ceiling collapsing from the weight of the water build up. Or alternatively, when a plumber needs to cut out sections of plasterboard to find where the problem is coming from. This gives them access to the pipes above so that they can find and fix the issue. The picture was taken on a water damage kitchen claim we were managing. We were called in after a plumber cut a couple of holes to locate and stop the leak. This type of damage is simple to repair. Our plasterer cut the plasterboard to the nearest joist, replaced and skimmed it. Then the entire kitchen was re-painted. Insulation and joists can also get saturated – so don’t overlook them. Water can also track down your joists before pooling on the plasterboard and insulation. So depending on how long it has been dripping, mold and rot may have started to grow. Once we remove the plasterboard, we will check the condition of the insulation and timber. If your joists are damaged, don’t worry we provide a joist repair service too. In the majority of cases, simply drying and treating the timber is sufficient. However, if they are soft and weak, our carpenter will renew the timber. Light fittings, spot lights, extractor fans and other electrical items can also be affected and should be tested. Following an escape of water, it is common to see water leaking from a ceiling light. This is because it is an easy way for it to escape. Consequently, water can affect light fittings, spot lights, extractor fans, sockets, switches and plugs. If any of your electrics aren’t working correctly, our electrician will test them. Should anything need replacing, we will ensure your insurer covers the cost of renewing it. We took the picture during our assessment of a damaged bathroom. The extractor fan, ceiling and walls were all damaged by a leak from the flat above. Any other damage to your property? We can also deal with any other resulting damage to your property! Thanks to our team of specialist tradesmen, we can help with more than just your ceiling repair. We offer a complete drying and building repair service, including kitchen and bathroom renovations. If you’re not sure if the damage is covered by your insurance, just get in touch. We will take check your policy wording to see if your policy covers the repair costs. IC Assist has many satisfied customers and we are proud of the feedback we’ve received. You can see some of the reviews our customers have left us on Google, Facebook and My Builder. To see more examples of ceiling damage claims we have managed, have a browse through our Facebook albums. While you are there, you can also see our customer survey forms with genuine handwritten testimonials.